Yes, it’s hard to imagine we’re breaking up with DVRs. After all, we’re the ones who invented the darn thing. But that was back when AOL dialup was the way to the Internet future. Naturally, after a bad breakup, we reinvent ourselves. So, meet the new TiVo BOLT™, the world’s premier Unified Entertainment System. How is a TiVo BOLT different from a DVR, Roku player or Apple TV, you ask? Allow me to show you. Television is no longer about fidgeting with antennas and hoping the snowy static goes away. You now have a choice between cable and over-the-air antenna. And then there are your streaming apps – including Netflix, Hulu, HBO GO, Amazon Prime and more. Not to mention cool music apps such as Pandora, Spotify and iHeartRadio. The TiVo BOLT is ground-breaking and unique in offering a Unified Entertainment System; no other device matches the TiVo BOLT in combining cable, over-the-air and streaming programming into one. TiVo BOLT is smaller, sleeker, sexier. Say goodbye to the big, clunky, black boxes known as DVRs. TiVo BOLT is a fraction of the size of the DVRs you’re used to. With clean lines, gentle curves and a soft white chassis, TiVo BOLT is a refreshing presence for your entertainment setup without the clutter of other devices. That’s enough to make any DVR jealous. Despite all the cord-cutting hype, most of us still use good ole fashioned cable to get all our TV entertainment. But why settle for an ordinary cable DVR? 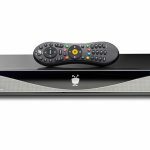 TiVo BOLT replaces your cable box, giving you access to all your cable channels with the DVR capabilities you need to record all your cable content. But we’ve also got new tricks, such as SkipMode™, which lets you skip an entire commercial break in a recorded show with the press of a single button – getting you back to your show instantly.1 And then there’s QuickMode™, which lets you watch your recorded content 30% faster with pitch-corrected audio – perfect for slow-moving sports, news or awards shows. We forever changed the way people watch TV when we invented the DVR. With the way TV is now rapidly evolving, it’s about time to do it again. Goodbye, DVR. Hello, TiVo BOLT. © 2016 TiVo Inc. All Rights Reserved. TiVo, the TiVo logo, the TiVo silhouette logo, TiVo BOLT, SkipMode and QuickMode are trademarks or registered trademarks of TiVo Inc. or its subsidiaries worldwide. All other company, product and brand names, logos and trademarks are the property of their respective owners.